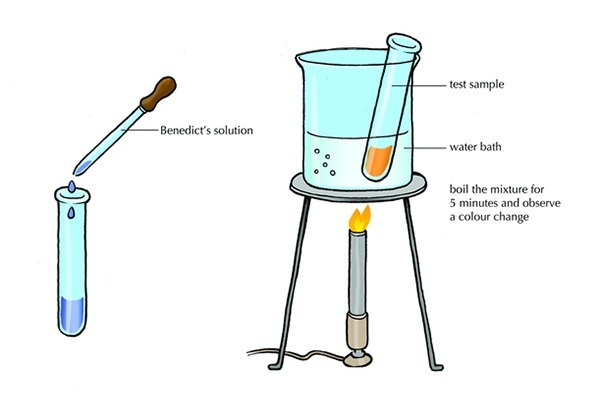 Benedicts test procedure is used to detect the presence of sugars present in any chemical. That’s why Sugars can be divided into reducing and non-reducing. This division is on the basis of their ability to react with any reducing agent. Reducing Sugars: All those sugars, which have actually or potentially free aldehyde or ketonic group are known as. Non-Reducing Sugars: The sugar in which the aldehyde or ketonic group is not free is known as non-reducing sugars. Benedict solution, 1 % solutions of all the sugars provided, Test tubes (also some extra test tubes in case experiment goes wrong), Test tube stand, test tube holder, Spirit lamp. 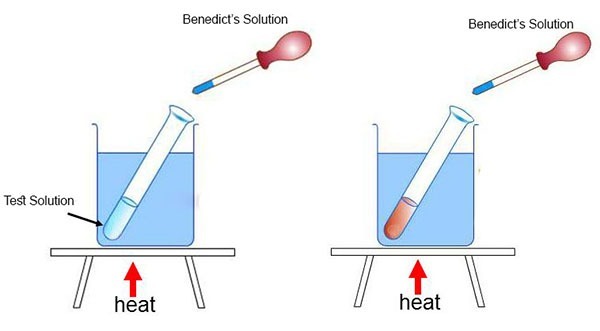 Take one ml of test solution of any given chemicals (Sucrose, Maltose, Fructose, Glucose) in the test tube and add about half ml of Benedict solution about 10 drops of benedict solution. Heat the solution (Test solution and Benedict solution) for three to five minutes to boil taking care that it does not bubble out. If mistakenly bubble out you have to take the solution again in another test tube. After heating, you will notice change in color which indicate the presence of reducing sugar. Change in color will show a range of colors depending upon the concentration of reaction product. If the heating is slow, the product formation is also slow, it will change its color from dull green to yellow and then brick red. Only sucrose is a non-reducing sugar. Rest of all the sugars (Glucose, Fructose, Maltose) given are reducing sugars. Prepare all the solutions very carefully. Heating should be very carefully to avoid any accident. Angular heat should be provided at the base as shown below. Check all the experimental chemicals and apparatus if they are proper for experimentation.